Everyone is looking for less expensive, quieter ways to keep their home cool during the hot summer months. A tower will be the best solution to cool a room or office. Lakso is one of the best brands among the tower fan. They are reputed to manufacturing cheap but high-performance tower fan for many years. Do they carry their legacy and trust with Lasko 2551 Wind Curve Platinum Tower Fan? Well, the appealing budget-friendly price tag really makes this tower fan worth to buy and amazingly it is one of the best selling tower fans on AMAZON and eBay. The oscillation feature is a great plus for this Lasko wind curve fan. 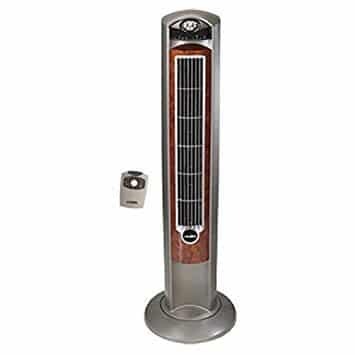 It can oscillate up to 70 degrees though standard tower fan must have 90-degree oscillation. But with this limited range oscillation, it can able to spread the air all over the room. You can use it often and the great advantage is the oscillation doesn’t create squeaking sounds like other kinds of fans. It’s one of the coolest features of this tower fan. You can set a desired lowest temperature in which you don’t need to run the fan at full speed. The thermostat of this tower fan will decrease the power of the fan when the room temperature reaches you desire limit. So the fan speed will also automatically decrease and this may be also a good technique to save your electric bill. Lasko 2551 wind curve platinum cooling fan has three-speed setting options. They are: High, Medium and Low. The speeds modes are suitable for hot summer. This Lasko tower fan comes with a infrared remote control. You need to point the remote control straight toward the fan sensor, otherwise, it will not operate well. The remote control of Lasko 2551 looks very wonderful with the rectangular shape. It has five control bottoms and they can be used to operate power (ON/OFF), Timer, Oscillation (ON/OFF), Speed (High, Med, and Low), Air Ionizer (ON/OFF). The remote requires two AAA size batteries for functional activity. The sad news is you will not get any batteries for remote in the box of the fan. It will not generate any beeping sound when you press the remote which will help you to change the setting without disturbing your partner sleep. Set up the time from 0.5 hours to 7 hours using the remote control or manual bottoms on the top of the fan. Staring for half hour, you can set the programmable time with 0.5 hours of increment. That means you can set the timer at 0.5 hours,1 hour, 1.5 hours, 2 hours, 2.5 hours, 3 hours, up to 7 hours. This automatic timer feature is important while you are sleeping at night. In the early morning, the outside temperature trend to be lower than midnight. So, you may feel cold in this duration. You need to turn off the fan switch at this time. Setting the timer according to this time can help you to sleep well without any interruptions. Also, this can help us to save the electricity bill. It comes with a fresh air ionizer. This removes a significant amount of the particulate matter and odors to keep the room smelling new and fresh constantly. It’s very difficult to find the remote control in important time. The beautiful remote control storage system in the back of this Lasko tower fan keeps it safe and easy to find. Moreover, a sturdy carry handle of this fan helps you to drag the fan effortlessly from one room to room. This Lasko 2551 wind curve fan is definitely a cost-effective fan. For the features it comes with, such as the gentle breeze and air purifier, this is a great buy. It is also substantially cheaper than the Dyson tower fan models which can frequently run a couple hundred dollars. At $60, this is substantially less expensive. On the other hand, this product is also a little more expensive than a traditional desk fan. While Lasko 2551 42 inch Wind Curve Platinum Fan is overall a better product with more features, it is also more costly. The Lasko 2551 tower fan has nice curved design but unfortunately common design. You may find many tower fan of same design as this Lasko tower fan model. The design is not as unique as Vornado Air Circulator or Dyson Tower Fan. It looks like The outside body of this fan made of the cheap plastic material. The front grill of this fan doesn’t look good. The key or bottom at the top does not add any value to improve the appearance of the tower fan. The fan is available in two different colors. One is fake wooden and another is silver color. The fake wooden facade design on this tower looks better than silver. The wooden color looks unique, stylish and classic. The indication lights at the top of the fan work perfectly. But the ionization indicator light is too bright at night. This can hamper your sleeping. Wish that it doesn’t come with any ionization indicator light. It is a challenge to break this product. The tall tower design comes with a sturdy base that makes is challenging to knock even. You could potentially even lay this device on its side and still have it function well. With a handle to easily transport from place to place, you shouldn’t have to worry about dropping this device either. Without rotating blades, there simply aren’t very many parts of this device you can break. Lasko 2551 tower fan is a very durable item. This Lasko 2551 tower fan is a quiet device. The traditional ceiling fans and desk fans come with rotating blades that can be very noisy. Even noisier is the box units that used to sit in windows and still exist in older buildings. This device is substantially quieter than those allowing you to watch TV and have conversations without being disrupted. On the other hand, this device is still a little bit louder than the Dyson tower fan models that simply push the air instead of generating their own breeze. While you can definitely still hear the motor running, it is quiet. This device has everything you’re looking for in it and it does all of these things well. It keeps the air cool and fresh and comes with an energy saving mode that will keep utility bills low. Without any visible fan blades that try to knock and buffet the air, the breeze is both quieter and more gentle than a traditional ceiling or standing rotary fan. Besides, for those wondering where all of the particulate matter goes, this device stores the garbage in the back for disposal later. It also comes with the classic features you would expect, such as the ability to change the direction of the air current by just pressing the levers. It also comes with an energy saving mode that allows for you to save the energy and keep utility costs low and also comes with a comfortable handle for transportation elsewhere. With so many different options for various functions, this is a truly top of the line model that can effectively compete with the best of the models out there. This machine is perfectly constructed for what it does. At 42 inch height, Lasko 2551 is one of the tallest commodities and options out there. This gives is a tall, slender design that allows it to go with the decorations in the room while not taking up an inordinate amount of space with a box design.You can change the direction of the breeze. You can control the power level quickly from the remote. You can move the fan in up or down direction. These options will help to remove the hot air of the top of the room. We recommend using tower fan in the upward direction when you are using it with air condition. It will increase the air circulation of the room more efficiently. You can purify the air and keep it cool at the same time. For evidence, the device stores the refuse in the back. This is a well-designed piece of equipment. ♡ Very quiet in nature even on the highest speed mode. The sound level is nothing if you compare it to box or pedestal fan. ♡ It will take 10 minutes unboxing the fan and assemble it. ♡ Airflow output is very good and it easily covers a medium size bedroom. ♡ The fan blades collect very little dust. ♡ Lasko tower fans very easy to clean but they don’t provide any instruction in the user manual. You can get enough information about cleaning methods of tower fan in online. ♡ Easy to set the fan up to your bed height. ✘ This fan model makes the audible clicking sound in every 30 seconds while it’s oscillating. ✘ The light is little bit bright for sleeping in the night. ✘ The remote bottoms work slowly and you have to press bottoms harder to work. We have tested this Lasko tower fan from 40 feet distance between the fan, and the remote control worked perfectly. The blue led light indicates that the air ionizer of the tower fan is on. The air ionizer is an integrated device that ionizes the air particles, and thus it removes the microscopic harmful particles of the air. So that, you can breathe the healthy and fresh air in your room. Also, air ionizer removes the odors of the room. The power cord is approximately 5 feet long. This tower fan comes with Two prong power plug. The voltage rating of this tower fan is 110V(United State standard). So don’t take any risk by running it at 220V. Be careful about it. Lasko 2551 wind curve fan need little bit assemble.All you have to do is follow the user manual. We check the time, and it takes only two minutes to assemble. Without any doubt, Lasko 2551 is one of the best tower fans in the market. though it design is very awful but if you ignore that it will be perfect to cover for 200 square feet room. While it may lack some of the capabilities of the high-end Dyson items, this should be on everyone’s list for those looking for a portable air purifier or air conditioner. If you need a tower fan that can increase the aesthetic view of your home then go for Dyson AM07 Air Multiplier Fan or Vornado 184 Air Circulaor.